An early spring weekend saw an exciting gathering of young creatives and patrons at the Museum of Kyoto. 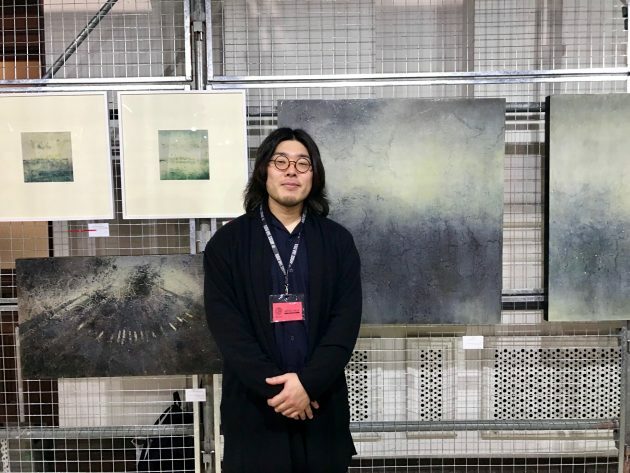 Held on March 2nd and 3rd at the museum’s annex — a Meiji-architectural style building and former branch to Kyoto Bank — Artists’ Fair Kyoto welcomed a variety of guests, each eager for inspiration. 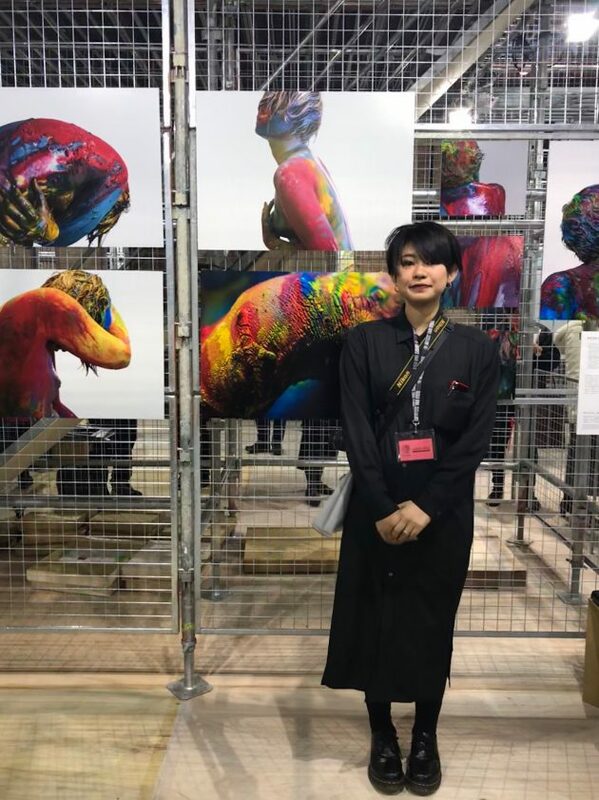 With additional installations at Kyoto Shimbun’s former printing plant, the fair was an occasion to showcase young talent, build artist-to-audience relationships and encourage the culture of purchasing art. Ushered in by soft ambient music, the guests found themselves completely immersed in floor-to-ceiling art. 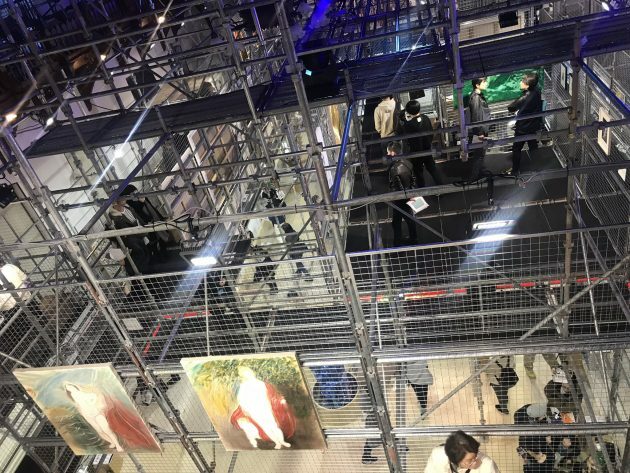 The exhibition itself was presented as a giant maze of steel scaffolding that functioned both as wall space for exhibits and walkways for visitors to navigate across two floors. The permeability of this scenography meant that wherever visitors turned there were vivid colors that would appear framed before them, spurring conversation one after the other. Slowly absorbing the scene while giving thought to which corner to explore first, visitors paused on the staircase to find the enormous, surreal monochromatic paintings by Taishi Nishi. He explained to us how he enjoys “pushing the boundaries of reality”: his fairytale-like paintings in strokes of black and white mostly revolving mostly around the adventures of one boy — quite plausibly the artist himself — exploring the land of his dreams. Climbing to the second floor behind other curious onlookers, we came across the dark, demonic sculptures of Takafumi Sakai, in a riot of dark, bold colors. 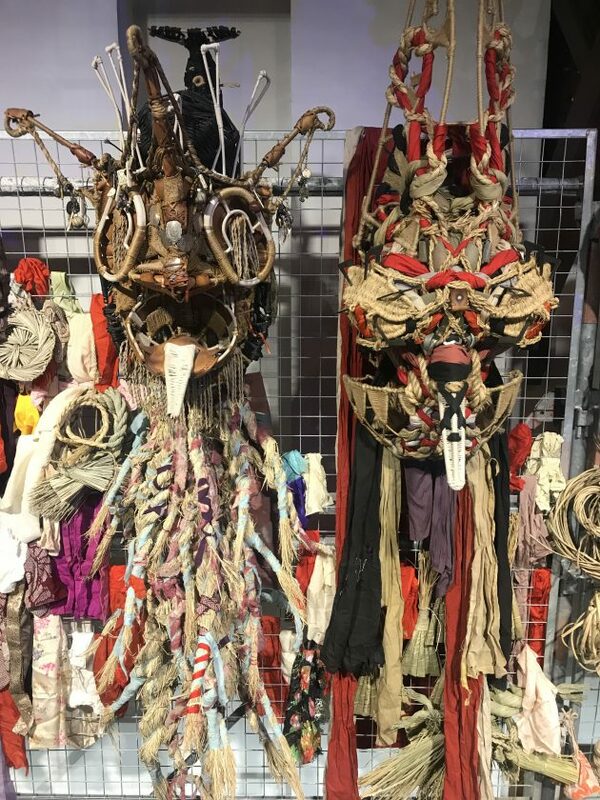 Shreds of repurposed materials, rope and shards of jewelry, had been fashioned into something akin to taxidermied animal heads. 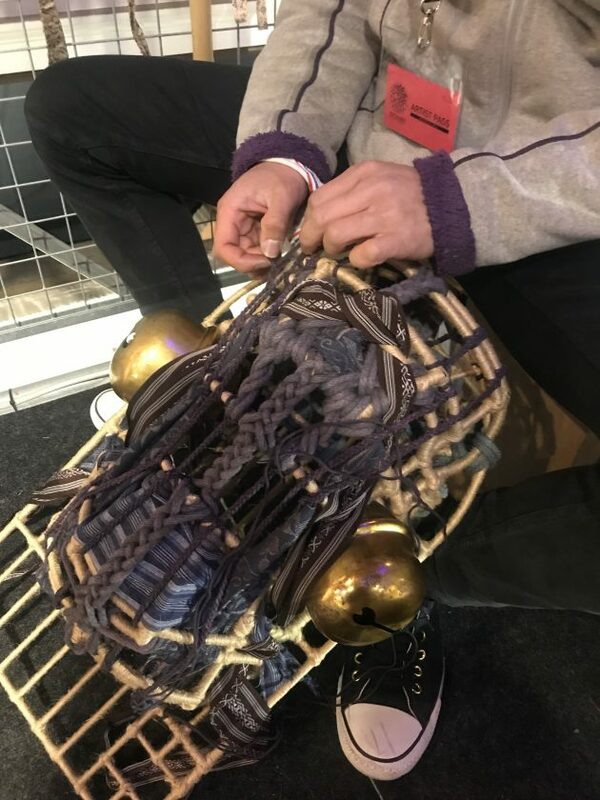 The artist himself sat in the corner, knitting strands of cloth and rope through an old football facemask — so engrossed in his work that he seemed unaware of his bustling surroundings. 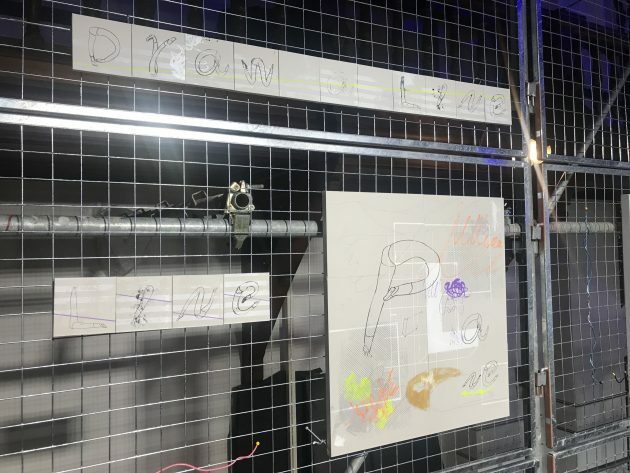 Sakai talked to us about creating his art from “left-over” second-hand goods, shedding light on what “value” means in the extremely consumerist society of today. Slightly wary of our footing as we traversed the skeleton walkway, we eventually looked up to discover the playful typography of Yoruko Okamura. The selection of characters formed of dancing pairs of female legs, the font is rendered in crude, yet flowing brush strokes. When asked the reason for choosing such a motif, Okamura answers sweetly, “I’ve just always found them cute.” Yet her original motivation for pursuing typography, she explains, lay in how she perceived the medium as an unexpected way to evoke emotions in the viewer—and not simply to transmit written messages. In an era of complexity surrounding issues of gender, her work seen here seems timely and worthy of many of the young visitors’ attention. From the heights of the second floor, the bright indigo hues of Mina Katsuki’s paintings below also caught our eyes. She described the approach to her highly immersive works as a pursuit of truth in a medium that crosses the boundary of language. The simple forms and bold brushstrokes lent the work great presence and we couldn’t help but stand before them in deep contemplation. Moving on to the intriguing photographic self-portraits of Kanako Shintaku. In the images, she is contorting her body in seemingly uncomfortable positions, looking pained as she does so. Splodges of pink and purple cover her from head to toe. Asked how the experience felt, she said it was like a newfound freedom, and sense of heightened awareness. “My hair is probably damaged too” she jested. She observes the change in the paint ’s texture that covers her, as well as the change in herself that occurs simultaneously. By the side of the entrance were the slightly iridescent painted panels by Daiki Nishimura. Nishimura uses oil, wax and minerals which lend an appealing texture to his paintings that allude to the natural world. He talked about keeping his paintings very elemental in nature, to illustrate them in their environmental existence. 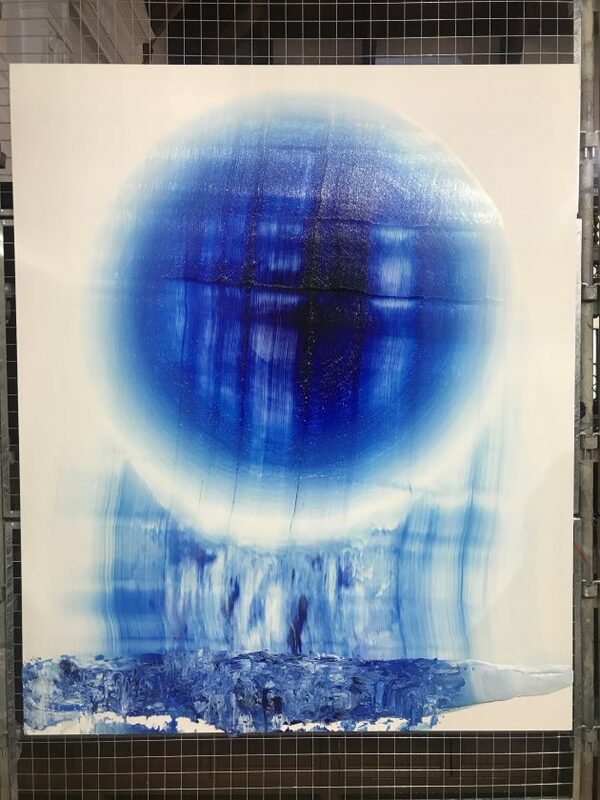 His series on show this weekend highlighted the element of water, and its importance in nature — triggering the audience’s thoughts on the deepening issue. 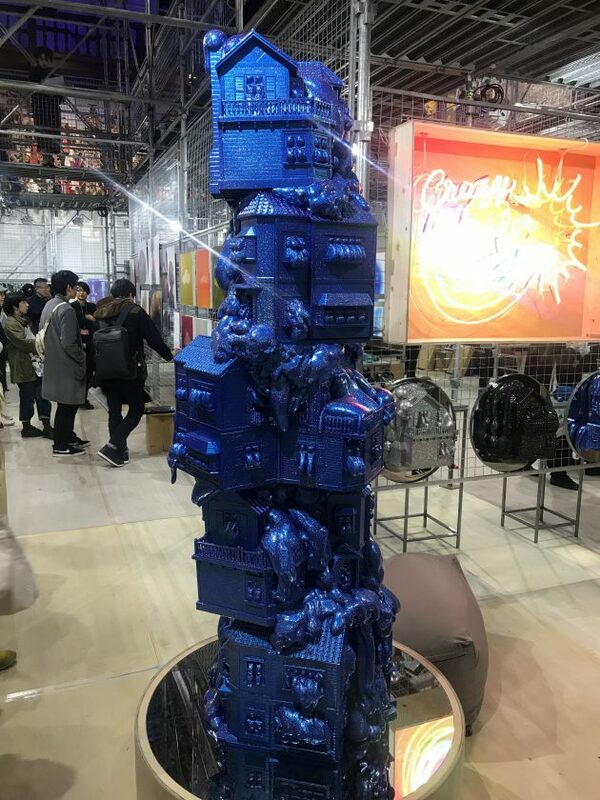 In contrast to Nishimura’s work was an artificial-colored neon-lit sign reading “crazy for me”, juxtaposed by a towering sculpture made by the same artist, a shimmering stack of blue houses melting into each other. The bubbly Aiko Yuno, while refreshingly honest about the uncertainty she feels about her own future, believes thoroughly in the momentary nature of happiness. She told us she enjoys being able to give form to the memories of objects she cherished in her childhood, adding a touch of glitter for good measure. All pieces were captivating in a way that lured visitors to take a step closer, ultimately adding far more time for visitors to cover the ground than they initially predicted. Halfway in, an overwhelmingly large face printed on a kite stares out into the open-air, hovering above us. The footage being played back beside it shows a diverse group of volunteers flying it together. 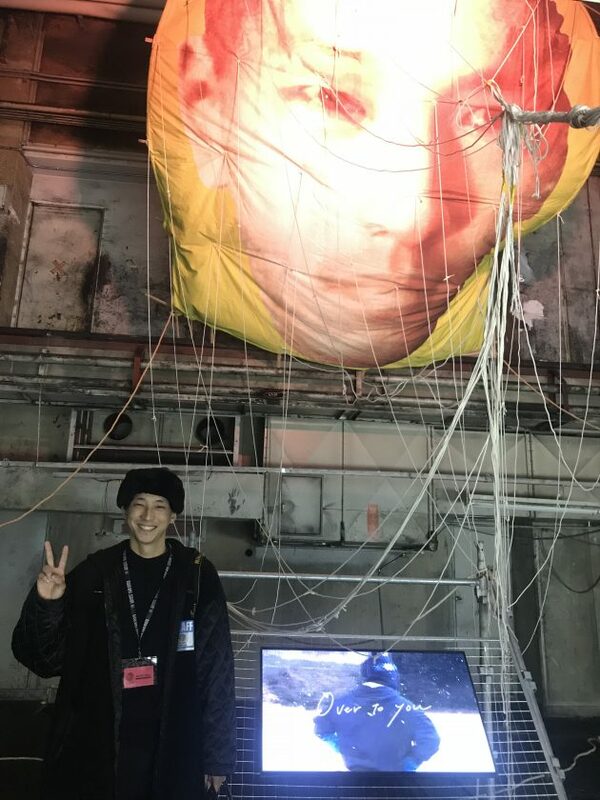 The artist and academic, Kohei Maeda, spoke to us enthusiastically about his idol, the famous Japanese 20th-century writer and scientist Minakata Kumagusu. In fact, we discover that the face upon the kite is a morphed version of his together with that of Kumagusu himself. “I identify with him, but I can never compete with his greatness.. But the moment we got that kite to fly together, sharing that moment — that was some real art,” he smiled with confidence. Among the works also on display at the Fair were the silhouettes of cars in earthy tones by Kotomi Atsuchi; Nana Kuromiya’s mirrored paintings of female nudes that resemble the interior of a kaleidoscope; Shinya Imanishi’s curious paintings lines of layered oil paints, some of it stripped away by hand to reveal abstract patterns, and much more. 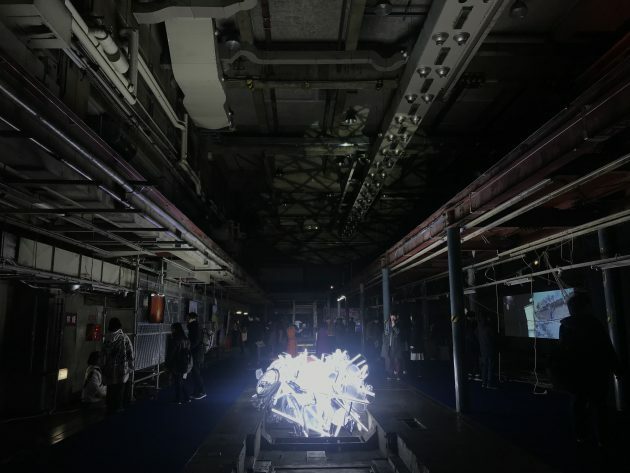 For its second year, AFK has proved itself worthy of being a highlight of Kyoto’s artistic calendar, bringing the energy of Kyoto’s local and international community together. 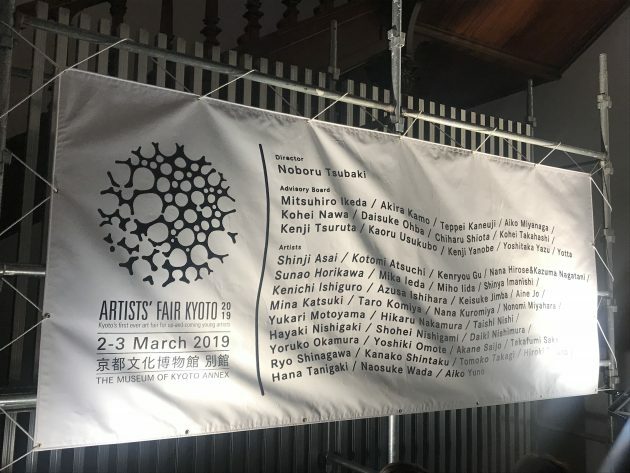 In a city where both tradition is sacred and innovation a necessity, we look to forward to seeing what 2020’s Artists’ Fair Kyoto may bring. Maithilee Jadeja is a recent graduate from Ritsumeikan University in Kyoto. She loves the summer, and mangoes. 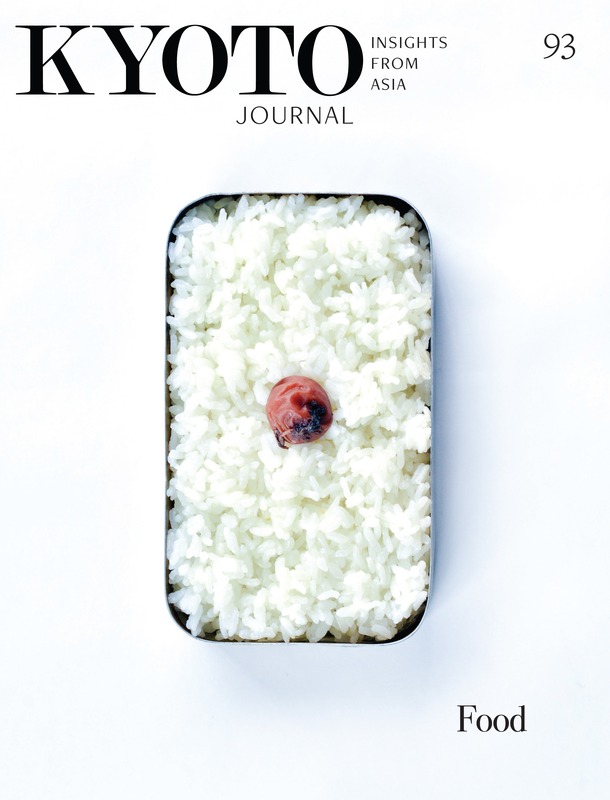 Kyoko Yukioka is a newbie at KJ, a bilingual writer exploring her roots in the ancient capital.